Dietsmann is dedicated to making a continuous effort to increase awareness of health, safety and care for the environment in the energy industry. To provide guidance to our entire staff in achieving this number-one priority, Company policies have been formulated. These policies deal with the specific areas of health, safety, security, working conditions, sustainable development, environment protection and employee behavior. There are currently ten policies in place. Ensuring that all employees receive the appropriate training to carry out their tasks without risk on a regular basis. Promoting a culture and awareness of security amongst all employees at all levels within the Company. Carrying out regular specific audits in order to evaluate its safety performance and monitor its security systems. To provide regular medical check-ups for Dietsmann employees in conjunction with occupational medical services. Combating any form of discrimination in all its activities. Considering any attempt to thwart or dispense with any of the above rules to be unacceptable and, therefore, reprehensible. Ensuring that everyone, at every level within the Company, understands that jeopardizing their own or other peoples’ safety by not respecting this policy could result in severe disciplinary measures being implemented. 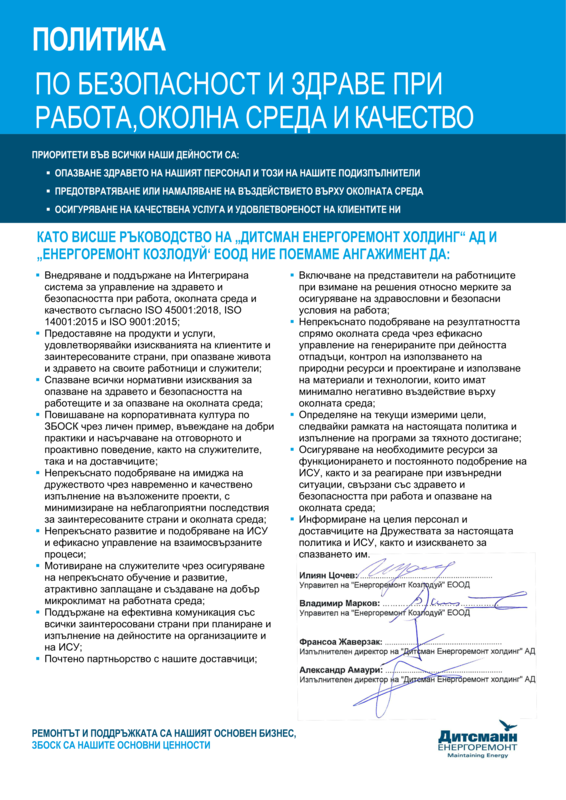 Allowing neither HIV infection nor AIDS to be used as grounds for the breach of contracts. Providing its employees with opportunities to involve themselves in the improvement of Dietsmann’s performance by enhancing awareness of and providing training in the area of sustainable development. Assess specific risks and implement a crisis management plan for emergency pollution situations; periodically review and improve this plan. Dietsmann’s quality policy focuses on the continual enhancement of the quality of its services by implementing the high-level standards applicable to all Dietsmann branches and projects. 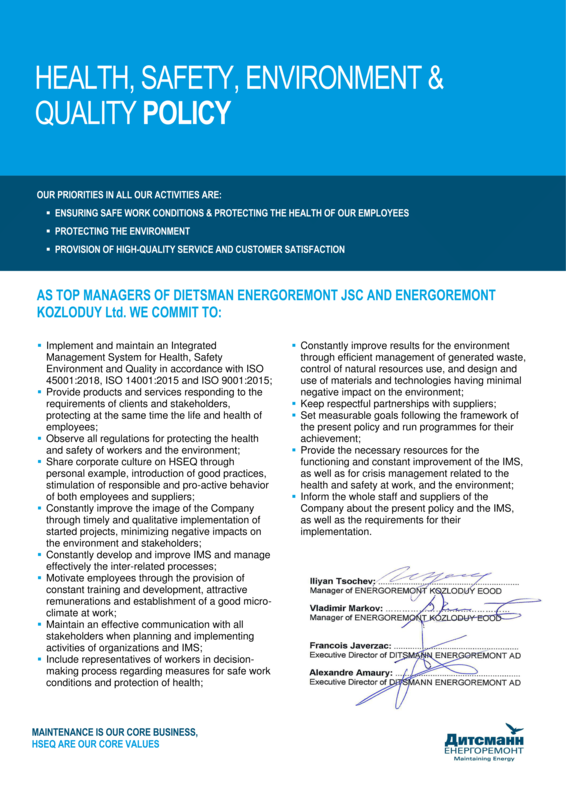 The quality of all Dietsmann projects is continuously improved, measured, evaluated and validated for effectiveness both internally and externally by the implementation and maintenance of HSEQ Management Systems. The Managing Director is responsible to the Chairman of the Board for ensuring that this Policy is respected. Dietsmann’s CSR Policy is based on the Company’s core values of loyalty, respect, integrity, efficiency and transparency and aims to clarify to all the Company’s stakeholders how Dietsmann is working on fulfilling the United Nations Global Compact principles to which it committed in 2011. The Policy reflects how Dietsmann strives to implement a development that promotes People, the Planet and Profit. Safeguarding the proper enforcement of Dietsmann’s Business Code of Conduct and Ethics Policy through the “Upline” assistance and grievance mechanism. Dietsmann takes its stakeholders’ expectations into account by making truthful, reliable and constant communications with all its stakeholders an integrated component of the Company’s core strategy. Providing a motivating work environment that is rewarding and that leads to and encourages teamwork. Safeguarding confidentiality, information security and the preservation of business records. Monitoring the Company’s level of involvement. Carefully monitoring the Company’s environmental footprint, including greenhouse gas emissions, and encouraging and implementing eco-friendly behavior that mitigates Dietsmann’s environmental footprint throughout the organization.